We are Karine and Sebastien Benoit. We live with our two children, Maxime & Lauryne, and our "4 legged friends" in a charming small town of Aveyron called Firmi, in the heart of the old mining area Decazeville in France. Sebastien has bred Labrador Retrievers under the kennel name "De La Plaine Du Puy De Wolf" for many years now. We fell in love with the ENGLISH BULLDOG, when Cresus (son of Dandant Justification For Saint-Georges aka "Clyde") came into our lives. The affix "SO LOVELY BULL'S " was created in 2010, this name invokes in us the qualities and characteristic of the ENGLISH BULLDOG: "SO ....LOVELY ....BULL'S" = "So ... Wonderful, Charming, Cute, Beautiful, Delicious ....... Bull." Our affix is ​registered with the SCC (Société Centrale Canine) and FCI (Federation Canine International). 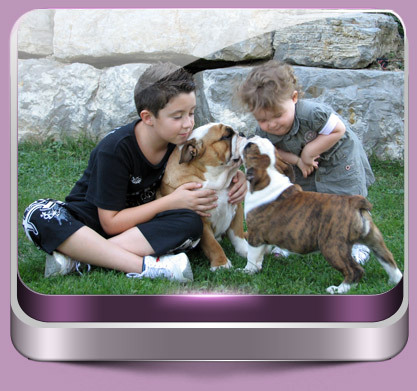 Sébastien holds the French certificate of dog breeding (No. 12 089) (Mandatory in France since 1999 for a person producing more than 2 litters per year). Our Kennel is declared and DNA tested. Our "Show Team" consists of two little princesses by the prestigious English Origins: Saint-Georges Sugasweet ... "Charlotte" & HIssing Little Bird ... "Bella". We are MEMBERS OF the ENGLISH BULLDOG CLUB (No. 5231 & No. 5232). A big thank you for putting trust in us to our friend Melissa WELLER (Saint-Georges Bulldogs UK) who did not hesitate a moment to provide us with "her best origins" (Charlotte & Bella) and Maggi HOWELL (HIISING Bulldogs UK). Also, thanks to Jeanette & Trevor Jones (Bandapart Bulldogs UK) and Melissa of Saintgeorges for their photographic contribution and their selection help. And finally thank you and congratulations to Ewa Larsson (Design by Ewa) to design the web-site of "SO LOVELY BULL'S". We wish you a pleasant visit to our web-site, and please feel free to sign our "guest book". We invite you to visit us in France with great pleasure .........by appointment only. ... please, see "Puppies Page" Copyright © 2011 So Lovely Bulls. All rights reserved.